Last month, Shout! Factory released a pair of brand new steelbook editions of the cult classics Streets of Fire and Bill & Ted’s Bogus Journey on Blu-ray. It’s worth noting that these are limited edition releases and the packaging is collectible, so I would recommend picking them up if you’re a fan of either film. Both films feature great new cover art by poster illustrator Antonio Stella, and they would also double as great Christmas gifts. First up is Streets of Fire, Walter Hill’s stylish and entertaining 1984 rock & roll fable, which boasts an awesome soundtrack of original songs written by Jim Steinman, Stevie Nicks, Tom Petty and Ry Cooder, and performed by the bands The Blasters and The Fixx. When rock star Ellen Aim (Diane Lane) is kidnapped by the Bombers, a 1950s-style motorcycle greaser gang led by Raven Shaddock (Willem Dafoe), her ex-boyfriend Tom Cody (Michae Paré) teams up with the badass army girl McCoy (Amy Madigan) and Ellen’s skittish manager Billy Fish (Rick Moranis) in order to rescue her. While Streets of Fire is arguably more style than substance, the style is oh so much fun to watch, with Andrew Laszlo’s cinematography capturing the film’s rain-soaked settings and stylized action scenes in a way that is pure eye candy. This is a B-movie delight, that rocks to a great soundtrack that instantly evokes the 1980s. 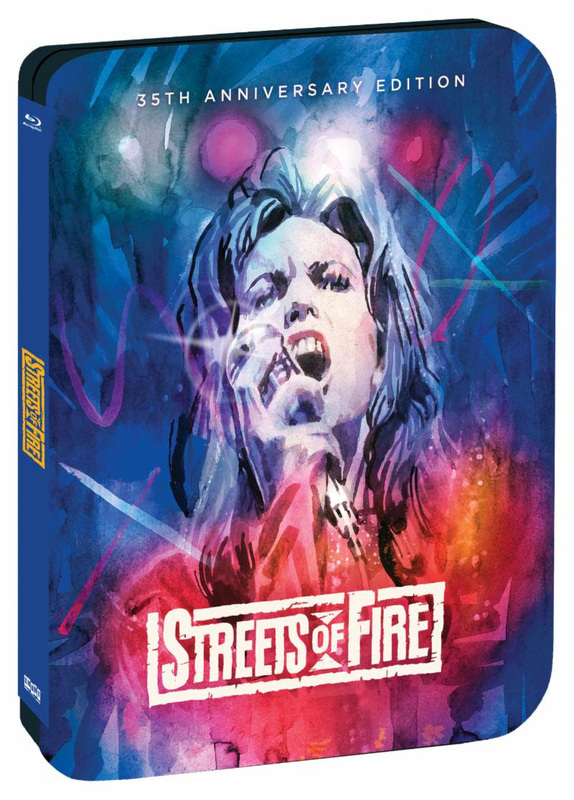 The Blu-ray includes a new 2K scan of the original interpositive, as well as a second disc featuring the two feature length documentaries Shotguns and Six Strings: The Making of a Rock N Roll Fable and Rumble on the Lot: Walter Hill’s Streets of Fire Revisitied, as well as music videos, vintage featurettes, and the theatrical trailer for the film. These are the same bonuses that were included on the regular Shout! Factory release from last year, but this one comes with the steelbook packaging and has been branded as a 35th anniversary edition. Streets of Fire is 93 minutes and rated R.
Next is Bill & Ted’s Bogus Journey, the 1991 sequel to the 1989 time travel classic Bill & Ted’s Excellent Adventure. This time around, evil robot versions of Bill (Alex Winter) and Ted (Keanu Reeves) have been sent from the future to kill them and take their place at a Battle of the Bands contest, in order to sabotage their chances of winning. The non-robot Bill and Ted end up dead and taking a journey with the Grim Reaper (William Sadler) to try and stop their bad robot replacements, in time for their band Wyld Stallyns to play in the competition. While I do prefer the first film, Bill & Ted’s Bogus Journey is still an amusing and often entertaining sequel, that embraces its own wacky sense of randomness and has become a cult classic for a reason. Bill & Ted’s Bogus Journey is 94 minutes and rated PG.